Part wine shop, part Parisian-inspired wine bar, Les Marchands is a very welcome addition to the Santa Barbara scene. The brainchild of sommeliers Brian McClintic and Eric Railsback, Les Marchands is tucked away in one of the many small groups of storefronts in the heart of Santa Barbara. McClintic’s journey through wine and the Master Sommelier program is documented in the film Somm, which is well worth watching. A Santa Barbara native, Railsback’s resume includes working harvest at a number of prestigious estates, including Emmerich Knoll, Dujac and Roulot, along with three years running the wine program at Michael Mina’s RN 74. Railsback makes Loire-inspired wines with Justin Willet at Lieu-Dit and also partners with MS Dustin Wilson, Willet and McClintic at Vallin, where the focus is on Rhône varieties. Les Marchands is both a wine shop and winebar. Visitors will find a wide range of bottles for sale, including an extensive selection of gems from Santa Barbara’s emerging young producers and less well-known appellations. Austria, Burgundy, Piedmont, Champagne and the Rhône all feature heavily among the European wines. The selection is pretty amazing for such a small shop. If I lived in the area I would be a regular, no doubt about it. The copper top bar and other appointments are all distinctly Parisian inspired, while the high ceilings with their exposed steel railings are a reminder this space was once a fish processing plant. Zalto glasses are among the many refined touches that take things to another level. All bottles are available in the winebar at just a 20% markup over retail, which is pretty enticing, to say the least. A young couple seated just behind me orders Christophe Roumier’s 2010 Chambolle-Musigny in half bottle. Sounds like a pretty great way to spend a leisurely Friday afternoon. A few seats down, one of California’s most reclusive winemakers is enjoying lunch after having picked out a couple of obscure gems from the retail shop. The food at Les Marchands is simple, casual and consists mostly of cold plates. 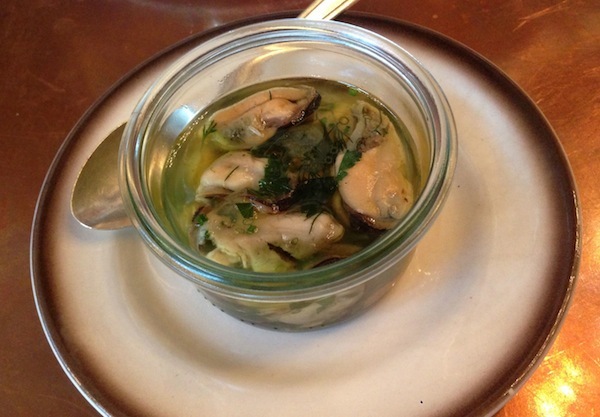 Fresh, vibrant flavors abound in the Santa Barbara mussels and lentil salad, which are both delicious. McClintic insists I try the brie plate. How can I say no? 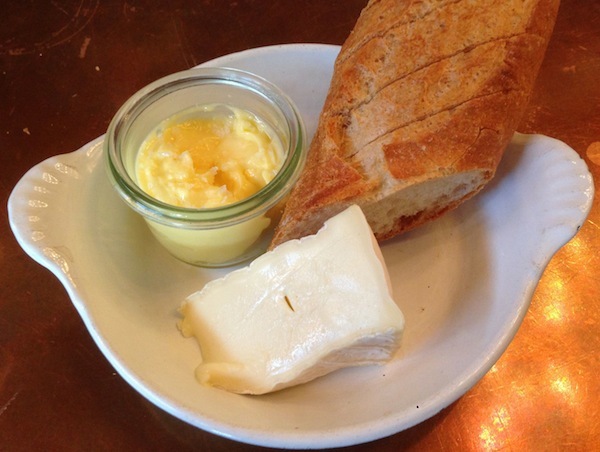 A true heart attack special, the brie is rich, decadent and fabulous. Bérèche is one of my favorite producers anywhere in the world. Sadly, the wines are virtually impossible to find, so whenever I see them on a winelist the choice is obvious. 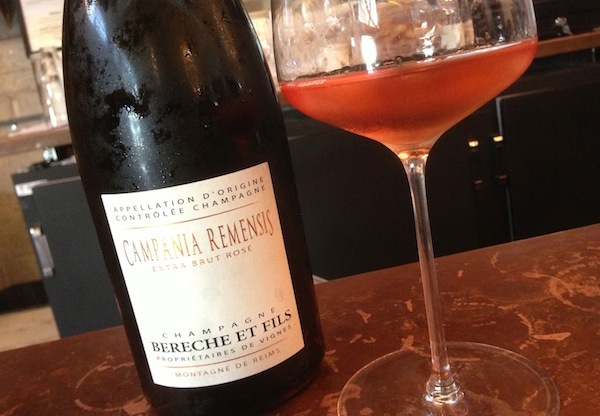 The NV (2009) Rosé Campania Remensis has put on wonderful weight and texture since it was disgorged in late 2012, yet it also retains marvelous freshness, energy and tension. All the elements are in the right place. What a gorgeous wine this is. I wish I could drink more than a glass, but an afternoon of tastings awaits. Still, one glass is enough to transport me back to Champagne and this world-class, family-run domaine just outside of Reims.